A veneer is a thin layer of material placed over a tooth, either to improve the aesthetics of a tooth or to protect the tooth's surface from damage. There are two main types of material used to fabricate a veneer: composite and porcelain. A composite veneer may be directly placed (built-up in the mouth). A porcelain veneer is indirectly fabricated by our dental technician in a laboratory, and later bonded to the tooth, using a resin cement. What is the procedure of getting porcelain veneers? 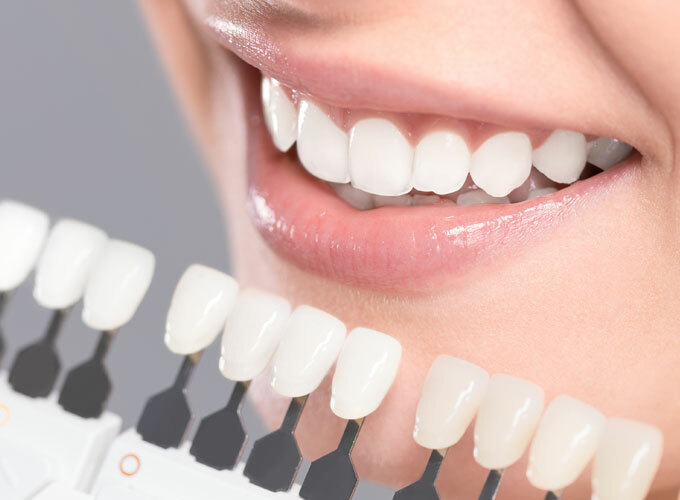 First thing is to schedule consultation appointment on veneers where you would discuss with Dr Malakonakis your goals and what you would like to achieve with your smile and to see if veneers are suitable for you. Veneers can take several appointments as it involves design and planning to ensure we achieve your goals and a confident smile. Once you and Dr Malakonakis have had this initial appointment and you are a candidate for the treatment, we would schedule you in for a full examination to assess all your teeth and their health. We may need to take x-rays, carry out a periodontal gum charting, photos of your facial profile and smile. Study models would also be taken of your mouth and sent to our laboratory to prepare a wax up of the proposed veneers to give you an idea of what the final result could possibly look like. Once we are happy with the proposal your treatment can commence. The next appointment would be a long appointment depending on how many veneers you are having. To prepare a tooth for a veneer, your dentist will remove about 0.25 - .75 millimeter of enamel from the tooth surface, which is an amount nearly equal to the thickness of the veneer to be added to the tooth surface. A model of your mouth is sent to our dental laboratory, which in turn constructs your veneer. It usually takes 2 weeks for our surgery to receive the veneers back from the laboratory. For very unsightly teeth, temporary dental veneers may be placed over the teeth during this time. At final appointment the dental veneer is permanently cemented to your tooth or teeth. The veneer colour can also be adjusted with the shade of cement. The cement is applied to the veneer and the veneer is then placed on your tooth. Once properly position on the tooth, Dr Malakonakis will apply a special curing light to the dental veneer, which activates chemicals in the cement, causing it to harden or cure very quickly. The final steps involve removing any excess cement, evaluating your bite and making any final adjustments in the veneer as necessary. Maintaining porcelain veneers is actually quite simple: Treat them as you would your original teeth, with routine brushing and flossing. One week after your veneers are placed, you will be required to return to the surgery for a follow-up visit and evaluation so that Dr Malakonakis can see how your mouth is reacting to the veneers and make any adjustments as necessary. Even if you feel the veneers are a success, this appointment is vital to your future oral health and maintenance. If you have a habit of grinding or clenching your teeth, Dr Malakonakis will take some impressions to send to our laboratory to fabricate an occlusal splint. A splint is a protective night guard to be worn whilst you are sleeping so you do not damage your veneers. You should also return every 6-12 months for regular check-ups to ensure your oral hygiene is optimal and maintained.